Why get your Vitamin D checked? Around 2013 my vitamin levels were finally checked to help figure out more about my gastroparesis issues. However, only Calcium was checked and NOT Vitamin D! My Calcium came back low and I was told to just take over the counter (OTC) vita D. I tried a pill form and it burned my stomach, so I tried a liquid form which went okay. However at $8 for a couple week supply while I wasn’t working, I didn’t take it too often. Plus I found it to give me migraine headaches. Click HERE for that blog. Dec 2015 was the next time I was able to get to a Dr who could do all the testing I needed to see what was going on. When I was done in the lab – 12 tubes later – I thought they had drained it all out of me! Thankfully, she checked my Vita D level and not just Calcium. I was very very low. Which explained my: tired feeling, leg pains, shortness of breath for no reason (asthma inhaler didn’t help), headaches, mood issues and an overall not wanting to do anything or get out of bed. All of these are symptoms to low vitamin D. At this point I was around 15 (range is 30 – 100). I was prescribed 50,000UNI (an amount given to patients with rickets) to take 1 pill per week until the levels come up. She thought it would take about 3 – 6 months at the most. It’s best to take the pill with a HIGH FAT MEAL, but as you know people with gastroparesis have to have low fat and fiber meal. So I did the best I could. By April 2017…. 1 year, 4 months and 19 days later…. I was at 37.1 (30-100 range). It took that long to raise my levels up 21 points. Which was an average of 1.3 points per month at a total of 200,000 UNI (per mo). To my shock the Dr told me to just use OTC Vita D now that I’m in the normal range (yeah all of 7 points into the range now). I told her I wasn’t comfortable stopping, now that I am finally feeling good and the fact it took me almost a year and a half to get back to this point. She thought I’d be fine and we’d recheck the numbers next year. Of course I called the Dr to ask for a Vita D lab test and listed off the above issues I’m having, since I didn’t want to wait until my next annual exam. Thankfully she was on top of it and called it in, I went on a Fri and results were back to me on Monday! In the 4 months with little vita D (foods when I can and a OTC vitamin) I am not sitting at 21 (30 – 100 range). This is a LOSS of 16 points (37-21) in 4 MONTHS! Almost 4 points a month!! Remember I was only gaining about 1 point per month at that 50,000 dose. Now I’m back on the 50,000 UNI once a week, as I wanted to continue doing all along. I had enough pills to do so, but feared it I continued (until the script ran out) we would not have the proper data for her to see that my body does not do well off of the pills. For now I just get to suffer 6-12 months from the symptoms until I can get my levels back up. When I get to the ‘normal’ range, I will not allow her to stop the meds. These symptoms are awful on so many levels: mind, body and family. Thank goodness I know my body well enough to call when something isn’t right and ask for the proper plan to get it checked. So if any of you reading this have similar symptoms (below in the blog) I urge you to do the simple blood test Vitamin D 25-OH. PILLS: Some have been asking on Facebook and YES this is a prescription of 50,000 UNI Vitamin D GEL caps. I still can not tolerate any other form. Excess Sweating – while mildly active or for ‘unknown’ reasons. Can The Norovirus Cause A GP Reset? December 2016 is here and Melissa is feeling something odd happening with her stomach. It doesn’t feel like the ‘normal’ GP flare, so could it be a cold or flu coming on? She had been in stores, around lots of sick people who where coughing up lungs. So maybe! The days went on with the continued high nausea until one night where she was unable to leave the restroom. The next morning, afternoon and night were the same. By now she KNEW this was NOT her gastroparesis so it had to be a bug of some kind. Before she had time to research the news came on with a school closer in town and the hospital not allowing visitors because of a very bad case of the Norovirus going round. What is it? Click HERE to read all about it keeping in mind Melissa ended up with almost everything it said….for TWO WEEKS! Yes she missed out on Christmas as she was so very sick and dehydrated at that point. The virus seemed to last a good 4 weeks in total. Then out of nowhere Melissa was able to eat almost everything! What an amazing sense of freedom to be able to not think about how much fat or fiber is in what you have in your hand nor if you stomach can digest it or will reject it. As with all good things, about 10 days of this blissful freedom came to a halt when one nigh the yogurt made her sick. Now she’d have to go back to what she became use to over the last 6 years of no-no foods to avoid and get herself back on track. Fast forward 6 months and Melissa is still able to eat most fresh fruit and vegetables without much issue (nausea, pain, bloating), even some nuts. However that lovely steak remains an issue. She still has her flare each month during hormonal changes for 3-4 days of pure nausea. Still has foods that she has to stay away from and recently discovered that Gluten has been an issue all along for her headaches, fatigue and inflammation. 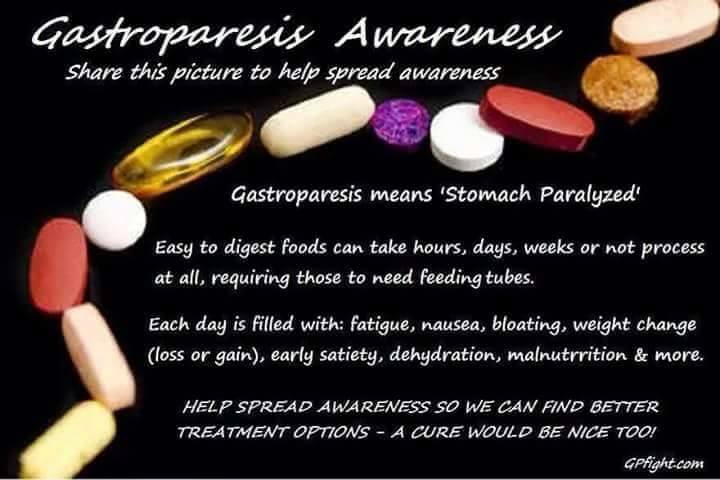 But to be able to tolerate once again a green salad for dinner or a piece of fruit from the tree is a BIG DEAL for her and anyone with gastroparesis who’s stomach’s can’t process the high fiber (if they are even able to eat solid foods). So was the Norovirus a bless? I’m not sure we will ever know the true answer to that, but in the meantime Melissa’s liven’ it up with the no-no foods! Back for a limited time are the snail SHIRTS and TOTES in our GP Fight Store!!!! Jan 1st – 13th ONLY. I’ll place our bulk order on the 14th which allows me to keep the costs low for all of us! MelissaGPfight.weebly.com was a side thought one day when I was answering so many question in Facebook Groups to help those with Gastroparesis. Many of which had the same questions, over and over again. So a light bulb came on in my head asking me why didn’t I have a better way to get the answers to their questions to them ~ saving me time from typing the same thing over and over again. Duhhh…. it was time to blog! Little did I know that 3 years later I would still be putting the info I deeply researched for quality advice and guidance to use. But with a new and improved website GPfight.com AND a store with GP Awareness items!!! HERE is a link to my very first blog post. Thank you all who have supported me over the years and I really do hope that I’ve helped a few people along the way. Our bill, now known as HR 2311 (former HR 842), has been reintroduced by Rep. James Sensenbrenner Jr. of Wisconsin. It is titled “Functional Gastrointestinal and Motility Disorders Research Enhancement Act of 2015,” and has been introduced/referred to the Committee on Energy and Commerce. This bill would expand research and promote awareness of functional/motility GI disorders such as gastroparesis. It is designed to help promote education of physicians and the general public, increase efforts to find new and effective treatments, expand clinical research, and create new medical centers designed to study these disorders and share information with others. I urge you to read the text of the bill and contact your representatives. Ask them to sign on as cosponsors and support this bill! I cannot express the importance of this bill.